Eighty headless skeletons unearthed between 2004 and 2005 from an ancient English cemetery in the city of York or the then Roman capital Eboracum holds proof that they all lost their heads far away from home. Archeologists say the burial ground was used by the Romans throughout the second and third centuries A.D. Almost all the bodies were of males with more than half of them had been decapitated, and many were buried with their detached heads. Eboracum was the Roman Empire's northernmost provincial capital during that period. global warming cause sea levels to rise as predicted in coming decades, thousands of archaeological sites in coastal areas around the world will be lost to erosion. With no hope of saving all of these sites, archaeologists Torben Rick from the Smithsonian Institution, Leslie Reeder of Southern Methodist University, and Jon Erlandson of the University of Oregon have issued a call to action for scientists to assess the sites most at risk. An Armenian archaeologist says that scientists have discovered a skirt that could be 5,900-year-old. Pavel Avetisian, the head of the Institute of Archeology and Ethnography in Yerevan, said a fragment of skirt made of reed was found during recent digging in the Areni-1 cave in southeastern Armenia. Avetisian told Tuesday's news conference in the Armenian capital that the find could be one of the world's oldest piece of reed clothing. A HISTORIC tourist attraction looks set to close to the public after council chiefs announced cuts and job losses within the museum service. The nationally important Rockbourne Roman Villa and Museum near Fordingbridge has now closed for the winter after being open daily throughout the summer and attracting |thousands of visitors. But the villa – the largest known villa in the area with its |history spanning from the Iron Age to the 5th century AD – will most likely not re-open as usual in the spring. Headless Romans in England Came From "Exotic" Locales? An ancient English cemetery filled with headless skeletons holds proof that the victims lost their heads a long way from home, archaeologists say. Unearthed between 2004 and 2005 in the northern city of York (map), the 80 skeletons were found in burial grounds used by the Romans throughout the second and third centuries A.D. Almost all the bodies are males, and more than half of them had been decapitated, although many were buried with their detached heads. Just imagine: a world without cancer. It's a tantalizing thought, recently floated by researchers at Manchester University in the UK. That world may well have existed, but in the distant past, according to their survey of hundreds of mummies from Egypt and South America. The researchers found that only one mummy had clearly identifiable signs of cancer. The study suggested that industrialization, pollution and the ills of modern life are to blame for the epidemic of cancer now seen sweeping around the globe. The people of Pompeii who died when Vesuvius erupted nearly 2,000 years ago were killed by intense heat rather than suffocation, according to a new study. Thousands of the Roman city's inhabitants were caught in a firestorm in which they were exposed to temperatures of up to 600 C, a team of Italian scientists believe. The temperatures would have killed fleeing people in just 10 seconds, according to the volcanologists and anthropologists from Naples, the city overshadowed by the volcano. Bulgarian archaeologists, led by lecturer Boris Borissov from the university of Veliko Turnovo, unearthed a skeleton estimated at 8000 years old, Bulgarian media reported on October 25 2010. The remains were found while land was being cleared for the construction of the Maritsa motorway, en route to Turkey, near the village of Kroum, municipality of Dimitrovgrad. Experts say that the skeleton, was from the Neolithic age, dates back to 6000 BCE, and belonged to a young boy, aged 10-15. A new project has been launched this week to explore East Oxford’s Roman and medieval archaeological sites. Led by the University’s Department for Continuing Education, the project has been made possible by a £330,000 grant from the Heritage Lottery Fund. A RARE glimpse into the world of Roman funeral rituals is on offer to visitors to DIG in York. Archaeologists from York Archaeological Trust, who are excavating the Hungate site, have unearthed a small Roman cemetery which has so far revealed 20 burials and six cremations. In two graves, which contained the remains of Roman citizens, was an assembly of rich grave goods. It has been 100 years since excavations started on the Madinat Al Zahra, the magnificent 10th century palace city near Cordoba in southern Spain. Although only 11% of the city - built by the powerful caliph Abd Al Rahman III - has been uncovered, it is unlikely that it will take another century to unearth the remainder of the site given the rapid advances in excavation technology. ARCHAEOLOGISTS in Abergwyngregyn may have discovered one of the most iconic royal buildings of the 12th century. Up to 20 archaeologists are digging into the history of the area which has links to the medieval Prince Llewellyn. The dig has already unearthed a building which archaeologists say could be a royal court. It's not surprising that archaeologists are, on the whole, pretty poor business people: they don't want to be business people. But an industry that employs thousands of people in hundred of companies, partnerships and freelance operations, turning over £100m a year, IS a business: the question is whether we embrace that fact, and see what we can do to improve, or we ignore it and trust to luck. ARCHEOLOGISTS are bidding to shed light on one of Notts' most mysterious ancient monuments. Three years ago the Forestry Commission revealed that the Friends of Thynghowe had found a Viking meeting place in the Birklands, part of Sherwood Forest, near Mansfield. The earthen mound has now been listed on English Heritage's National Monument Record. New studies have also found the name Thynghowe in an ancient Sherwood Forest book dated to around the 1200s. But more research is needed to understand its mysterious story. The remains of a sunken warship recently found in the Mediterranean Sea may confirm the site of a major ancient battle in which Rome trounced Carthage. The year was 241 B.C. and the players were the ascending Roman republic and the declining Carthaginian Empire, which was centered on the northernmost tip of Africa. The two powers were fighting for dominance in the Mediterranean in a series of conflicts called the Punic Wars. Archaeologists think the newly discovered remnants of the warship date from the final battle of the first Punic War, which allowed Rome to expand farther into the Western Mediterranean. Neanderthal youngsters that made it to the "terrible two's" were large, sturdy and toothy, suggests a newly discovered Neanderthal infant. The child almost survived to such an age, but instead died when it was just one and a half years old. The remains of this infant -- a lower jaw and teeth unearthed in a Belgian cave -- are the youngest Neanderthal ever found in northwest Europe, according to a study that will appear in the Journal of Human Evolution. Since the remains of two adults were also previously discovered in the cave, the fossil collection may represent a Neanderthal family. A stash of more than 50,000 Roman coins found in a field by a treasure hunter has been valued at £320,250. The exact value of the hoard, which was uncovered in a field near Frome last April, was determined following several hours of debate including the differing opinions of three experts. The coins, stashed in a large jar, include five particularly rare silver pieces made for the emperor Carausius, who ruled from 286 to 293AD. Archaeologists have discovered Iron, Bronze and Roman Age remains on the route of a new bypass on the Powys/Shropshire border. In a dig before the construction work on the A483 Four Crosses bypass, Bronze Age burial monuments, Iron Age burials and metalworking, and Roman metalworking and farming activity are believed to have been found. The Welshpool-based Clwyd-Powys Archaeological Trust (CPAT) said today that archaeologists will now analyse the findings. It’s fair to assume that Valdemar the Conqueror, while ruling over Denmark in the early 1200s, ate like a king. But, what was the diet like for the peasants below him? The answer depends on where in Denmark the peasants called home. Radford University anthropology professor Cassady Yoder researched the diets of peasants of medieval Denmark and found a significant difference in the foods consumed by those living in rural areas as opposed to city-dwelling peasants. Yoder’s research was published in the September issue of the Journal of Archaeological Science. As part of her research, Yoder examined the diet of Dane peasants in Ribe, Denmark’s largest city during medieval times, the mid-sized city of Viborg and the population buried at a rural Cistercian monastery. Yoder found significant regional variation among the different sites. She says the city dwellers in Ribe and Viborg ate more protein rich foods such as meat from cows, pigs and fish. INVESTING in heritage makes sound economic sense, with regional and local communities and businesses, in particular, benefiting, according to the 2010 Heritage Counts report prepared by English Heritage on behalf of the heritage sector. Over the past decade, investments in 72 historic visitor attractions across the country have created 3,600 jobs and safeguarded a further 6,900. On average, each site has generated almost £3 million of additional expenditure in regional economies. Is the common nature of cancer worldwide purely a man-made phenomenon? That is what some researchers now suggest. Still, other specialists in cancer and in human fossils have strong doubts about this notion. The end of County Archaeology in Nottinghamshire? 'Today Notts County Council have just published proposals to cut their conservation budget by 75% and to reduce their staff from 33 to 6. This will effectively mean the end of all county archaeology services in Nottinghamshire. At the moment it seems unlikely that any of the remaining 6 staff will be archaeologists. under the catagory B services list. "Reduced access to the Historic Environment Record for all external service users. Following the sale of the Crosby Garrett helmet by auction at Christies on Thursday for over £2 million, the CBA has called for an urgent review of the Treasure Act by the Coalition Government. The review of the Treasure Act was due to have taken place back in 2007. We are writing to the Minister for Culture, Communications and Creative Industries Ed Vaizey MP to ask him to ensure that the long-promised review happens as a matter of urgency. It was a tragedy that the Crosby Garrett helmet has now apparently disappeared into a private collection and may never be seen in public again. This is not in the public interest, and it is certainly highly frustrating for all the supporters of the fantastic appeal to raise funds to keep the find in Cumbria in a public museum where it surely belongs. The CBA believes that the definition of Treasure should be extended to incorporate Roman base metal hoards and single finds of Roman and Anglo-Saxon coins made of precious metal. At the same time the CBA will be asking the Culture Minister to speak with colleagues in the Ministry of Justice to move forward with the implementation of aspects of the Coroners and Justice Act 2009 which relate to the Treasure Act. The Hungate excavation is the biggest ever archaeological dig in York city centre. Highlights of the dig include uncovering part of a 1,700 year old Roman cemetery and learning more about Viking York. The dig began in 2007 and is scheduled to take five years, at a cost of £3.3 million. A rare Roman helmet dating to the late first to second century A.D. fetched nearly $3.6 million dollars at a London auction on October 7. 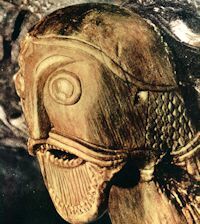 The bronze helmet and face mask, (seen above in an undated photo), was discovered in May 2010 by a treasure hunter using a metal detector in a field in Cumbria, a county in northwestern England. THE search for treasure in the heart of Cheltenham has begun. Archaeologists began digging trenches in North Place and Portland Street car parks yesterday. The work comes as the borough council prepares to develop the site. Earlier this year, the authority changed its mind on the future of the car parks, which are in line for development under the Civic Pride scheme. HISTORIC remains of a Roman fort unearthed during excavations in Exeter will be on display to the public for the first time this weekend. As the Echo revealed in the summer, the city's early history could soon be rewritten as a result of the extraordinary find on the former St Loyes Foundation site in Topsham Road. And visitors will have the opportunity to explore the area at a open day on Saturday. With Roman remains dating back to approximately AD50, the site owners Helical Bar PLC and Urban Renaissance Villages said they are keen for the general public to visit and gain a better understanding of how the city's history was shaped by the conquering Roman army. Amateur archaeologists in the Vale of Glamorgan believe they have uncovered a lost medieval village. The Time Signs archaeology students made the discovery behind the railway viaduct at Porthkerry near Barry. They are working with tutor Karl James Langford to prove his theory that the village of Whitelands existed. A VIKING treasure pendant, which has laid buried for more than 1,000 years, has been unearthed by an amateur archaeologist. The silver pendant, known as Thor's Hammer, has been declared treasure at an inquest in Harrogate. It had been found near Coprove in September last year, by metal detectorist Michael Smith, who, not knowing what it was, had dismissed it as worthless. THE Vikings are coming… on a Time Team special featuring war graves on the Weymouth relief road route. The mass burial pit was unearthed in June, 2009 on the top of the Ridgeway with 50 decapitated skulls and the bodies strewn nearby. The grim discovery will be included in a show called In The Real Vikings: A Time Team Special on Monday, October 11 at 8pm on Channel 4. Campaigners say they are concerned that there are still no permanent plans for a medieval ship discovered on the banks of the River Usk in Newport in 2002. The vessel has been called the world's best example of a 15th Century ship. As conservation work continues, campaigners say they are worried it could end up hidden in a warehouse. Severe restrictions on scientists' freedom to study bones and skulls from ancient graves are putting archaeological research in Britain at risk, according to experts. The growing dispute relates to controversial legislation introduced by the Ministry of Justice in 2008, which decreed that all human remains found during digs in Britain must be reburied within two years. The find is the latest in a series of high profile artifacts unearthed by amateurs armed with metal detectors. However the Country Land and Business Association is warning that property owners can become embroiled in costly legal disputes if they fail to agree contracts with anyone searching on their land. A detailed and well-preserved Roman parade helmet -- complete with fine facial features on its face mask, tight curly hair, and a griffin-topped cap -- sold at auction Thursday for 10 times its estimated amount. The helmet sold at Christie's auction house in London for 2.28 million pounds ($3.6 million). It had been estimated at 200,000 to 300,000 pounds (about $316,000 to $475,000). The buyer of the helmet was not immediately known. The Tullie House Museum in Carlisle, near where the helmet was found in May by a person with a metal detector, had launched a public fundraising appeal to try to procure the helmet as the centerpiece for a new Roman gallery. Tourism chiefs believe keeping a rare Roman helmet in Cumbria would result in a £3m boost for the area. The helmet was found by a metal detector enthusiast in Crosby Garrett, near Kirkby Stephen, in May. It will be auctioned by Christie's in London on Thursday, where it is expected to fetch £300,000. The latest newsletter from the Viking Ship Museum at Roskilde is now online. WHEN Hamish Mowatt decided to investigate a mysterious mound as he tidied an Orkney garden, he had little idea he would uncover a hoard of bodies that had lain untouched for around 5,000 years. Archeologists believe the tomb he discovered under a boulder outside a bistro in South Ronaldsay could lead to new insights into how our neolithic ancestors lived and died. But they face a race against time as water washing in and out of the newly uncovered tomb could wash away its contents and dissolve any pottery and human remains inside. Archaeologists think they have found two more Viking ships buried in Vestfold County south of Oslo. The biggest may be 25 metres long, larger than any found so far. Road construction near the old Viking trading center at Kaupang has led to the discovery of two large ship silhouettes on ground radar pictures. The pictures have been made possible through a venture involving the Norwegian Institute for Cultural Heritage Research (Norsk institutt for kulturminneforskning, NIKU) and the Ludwig Boltzmann Institute for Archeological Prospection and Virtual Archeology. The most recent reports from Turkey about the Roman spa complex of Allianoi, sent by the local Allianoi Initiative led by the archaeologist professor Ahmet Yaras, says that now only the tops of excavated walls and columns poke through sand that workers employed by the Turkish State Waterworks are laying. This outstanding Roman archaeological site is being made ready to be submerged under water as work resumes on the controversial Yortanli dam. If the dam's construction goes ahead and the valley flooded to create a reservoir, ancient history will be lost by an irrigation scheme with an expected life-span of only 50 years. A 2nd century map of Germania by the scholar Ptolemy has always stumped scholars, who were unable to relate the places depicted to known settlements. Now a team of researchers have cracked the code, revealing that half of Germany's cities are 1,000 years older than previously thought. Historians don't have access to this kind of precision when it comes to German cities like Hanover, Kiel or Bad Driburg. The early histories of nearly all the German cities east of the Rhine are obscure, and the places themselves are not mentioned in documents until the Middle Ages. So far, no one has been able to date the founding of these cities. The Romans weren't just dab hands at making beautiful vessels, ornaments and plates from glass; they were also good at recycling the stuff. A new study has found that towards the end of their rule in Britain, the Romans were recycling vast amounts of glass. But the researchers behind the study think this probably had less to do with their concern for the environment, and more to do with the fact that glass became scarcer in the northern fringes of the Roman Empire during the last century of their rule. Der LVR startete gestern das erste Internetportal zur Geschichte des Rheinlandes. Auf www.rheinische-geschichte.lvr.de finden Nutzerinnen und Nutzer Informationen zu zwei Jahrtausenden rheinischer Geschichte – von der Vor- und Frühgeschichte über die Römerzeit, das Mittelalter und die „Franzosenzeit" bis hin zur Gegenwart. Das Portal des Landschaftsverbandes Rheinland ist das erste chronologisch, geographisch und thematisch umfassende Online-Informationssystem zur rheinischen Geschichte. Es stellt das Rheinland als „Geschichtslandschaft" einer breiten Öffentlichkeit vor und ist Plattform für Forschung, Information und Diskussion. ARCHAEOLOGISTS say they are “disappointed” their plans for a Roman chariot racing heritage centre have been publicly criticised by a one-time supporter of the project. Colchester Archaeological Trust hopes to create a visitor centre on the site where the starting gates of Britain’s only Roman circus were unearthed in 2004. The plan was backed by hundreds Gazette readers who pledged money to help buy the former sergeants’ mess building in Le Cateau Road. Yet another handcrafted gold artifact has been found on Funen, just weeks after the discovery by a local fisherman of a gold bracelet from 800AD. The gold neck ring, estimated to be 1,500 years old, was found by professional archeologists. They say the 140-gram, 50-centimetre long ring was hidden away in a small clay pot believed to have been buried in the ground as a hiding place for valuables. The find comes after a fisherman in the town of Vordingborg this August found a golden arm ring dating back 1,200 years. The Oxford Experience summer school celebrated its 20th birthday this summer. 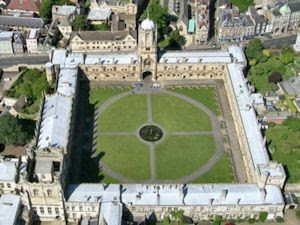 The summer school, which offers classes in a wide variety of subjects including archaeology, is held in Christ Church, Oxford. Photos of the Final Dinner celebrations can be found on the Oxford Experience web site – follow the “20 Years of Oxford Experience” link. Under a mild autumn sun, workers bustle about like bees at a Roman bath complex sprawling over a green plain in western Turkey in what looks like a regular excavation site. But the fate awaiting the impressive ancient spa of Allianoi is dark: the workers here are tasked with burying the site and not digging it out to reveal its secrets. Much to the consternation of archaeologists and civic bodies, the Turkish government has said it will go ahead with flooding the valley the site sits in to serve as a dam reservoir with a capacity to irrigate 8,000 hectares (19,760 acres) of farmland. It seems that Newnham College has been hiding several skeletons in its back gardens, providing a group of Sixth Formers with the perfect opportunity to get a rare taste of a hands-on archaeological dig. While digging at Newnham, the group of 20 girls from schools in Peterborough, London and Birmingham uncovered evidence that the college was once the site of a significant Roman settlement, as well as the location of a farmhouse from the 16th or 17th century. A new paper is set to re-ignite debate over the origins of so-called Homo floresiensis -- the 'hobbit' that some scientists have claimed as a new species of human. The University of Western Australia's Emeritus Professor Charles Oxnard and his colleagues, in a paper in PLoS ONE have reconfirmed, on the post-cranial skeleton, their original finding on the skull that Homo floresiensis in fact bears the hallmarks of humans -- Homo sapiens -- affected by hypothyroid cretinism. One of Scotland’s oldest and biggest archaeology festivals, this will see over 100 events, most of them free, taking place across the region, including guided walks, family activities, self-guided trails, evening lectures, special exhibitions, competitions and concludes with a two day conference at the Spectrum Centre in Inverness revealing what is new in Highland archaeology. Co-ordinated by Highland Council’s archaeology unit, the festival’s events are organised by a wide range of community groups, interested individuals and museums and professional bodies such as Historic Scotland and the National Trust for Scotland. “What’s really fantastic about the festival is that there are so many local societies involved,” Cara Jones of the council archaeology unit commented.